A dental extraction is the removal of a tooth from the mouth. 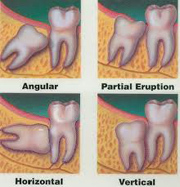 Extractions are performed for a wide variety of reasons, including extensive tooth decay & impactions (problematic wisdom teeth). Tooth extraction can be a painless procedure. Your dentist will give you a local anesthetic with the help of an injection. TYPES OF EXTRACTIONS:- Extractions are often categorized as simple or surgical. SIMPLE EXTRACTION:-These are performed on teeth that are visible in the mouth, usually under local anesthesia and require only the use of instruments to elevate and/or grasp the visible portion of the tooth. Typically the tooth is lifted using an elevator and a dental forceps which help in making the tooth loose in its socket and then subsequent removal. SURGICAL EXTRACTION (REMOVAL OF IMPACTED TOOTH):-This involves the removal of the tooth that cannot be easily accessed, usually because they are badly broken, incompletely erupted or impacted. The surrounding bone is then removed with a drill so as to facilitate tooth removal. Removal of wisdom tooth usually comes under this category. COMPLICATIONS:- 1) INFECTION - The dentist may prescribe antibiotics pre- and/or post-operatively, if they determine the patient to be at risk. 2) PROLONGED BLEEDING- The dentist has a variety of means at their disposal to address bleeding, however it is important to note that small amounts of blood mixed in the saliva after extractions are normal even up to 72 hours after extraction. 3) SWELLING- Often dictated by the amount of surgery performed to extract a tooth, minor to moderate swelling will occur. The swelling usually subsides in 7 days time. 4) SINUS EXPOSURE AND ORO-ANTRAL COMMUNICATION- This can rarely occur during upper molar extractions and a minor surgical procedure might be required to correct it. 5) NERVE INJURY:-This is primarily an issue with the third molars, but can occur with the extraction of any tooth should the nerve be close to the surgical site. Such injuries are rare and usually temporary but depending on the type of injury can be prolonged or even permanent. 6) DRY SOCKET:-It is a painful phenomenon that occurs, a few days following removal of a tooth(usually molars).This occurs because the blood clot within the healing tooth extraction site is disrupted. A dry socket typically causes a sharp and sudden increase in pain commencing 2-5 days after the extraction. A dry socket is not an infection and the only symptom is pain. The dentist has special medicaments for the treatment of dry socket. 7) TRISMUS/LIMITED MOUTH OPENING:-Jaw joints, chewing muscles can become sore after tooth extraction and it may be difficult for the patient to open his/her mouth. This condition subsides within a week of tooth removal.